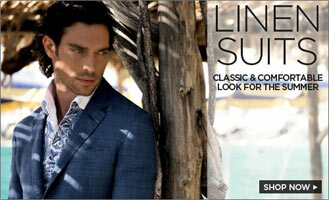 Linen wedding suits from MensUSA - Grab the best of both worlds on your most special day! Whether your attire is noticed otherwise or not, whether it stands out of the crowd on other occasions or not, you will for sure be the centre of attraction on your wedding day! The thought of having a whole crowd of people's eyes fixed only on you and your attire might make the job of having to choose your wedding suit a much more strenuous task than you expect it to be. And the memories, whether good or bad, stay with you for your entire life - through your wedding album, tagged face book photos, people talking about them, et cetera. All these put together give you much more reason as to why you should be extra careful when picking your wedding suit. Just the right choice for a summer wedding, linen wedding suits never lose out on style. What's still better is that they are light making you feel comfortable on the day you need it the most. Linen suits being the most preferred choice among men as their wedding outfit, there is never a dearth for choice when it comes to colours and styles. Mensusa offers a plethora of amazing selections and you will literally be spoiled for choice when it comes to choosing your white linen suit. Though perfect for the summer, the suits made in this timeless fabric render a lustrous look in any weather. Breathable and elegant, linen suits boast of a unique texture and are available in most of the colours. If you are planning an outdoor wedding, the white linen suits from Mensusa.com would be perfect for the occasion. Coupled with natural looking fibers like silk and wool, these suits are just the right choice if you want to stand out brilliantly on 'the' day. The traditional black suit carries with it an aura of its own. Accessories like cuff-links, silk ties or gold watches perfectly complement the crisp look of these suits. Natural linen suit with a neutral tone, or the cool grey linen suits also serve as a great choice for men who want the best of both worlds.